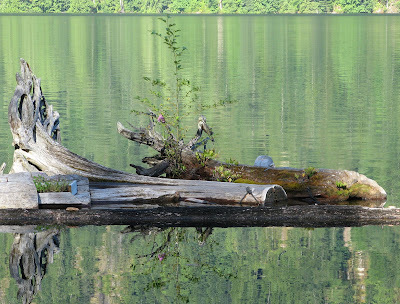 In March I told you about the return of Canada Geese to Hole in the Wall on Powell Lake. After much in and out traffic it settled down to two nesting pairs. Yesterday we were excited to see one of the pairs pass by the cabin with a single gosling. A female will lay from 2-8 eggs with the incubation period from 25-30 days. I'm not sure why only one gosling survived in this clutch. The Hole is pretty quiet this time of year, but maybe predators got to the nest. We do have raccoons in the area. Stumps play an important role at our float cabin. They help cut down wave action from wind and passing boats. They also provide an attractive and colorful addition to our water lot. Here are a few treasured stumps on duty in front of our cabin. A small alder tree, moss and salal plants give them lots of character. This stump is named Bede after the BD-5J homebuilt jet from BedeCorp. If you go to their website you might see the resemblance. This year Bede has a large lupine growing out of his well watered crevices. Right now we are surrounded by swallows. Each spring they arrive in the Hole to make their nests and raise their young. In the morning we are treated to aerial displays of acrobatic antics. Bugs are flying in the cool air, so the swallows are busy chasing them just above the lake surface. Occasionally, we will see a swallow dip into the water to make a catch, leaving a ring to ripple out after their passing. Tree Swallows are starting to make birdhouse selections. We have five to choose from, but this year the garden float birdhouse seems to be the most popular. Mom is moving in while Dad stands watch. This morning, one of the swallows perched on our swim ladder. He was so docile that he let me get within two feet before flying back to his garden float home. I just love to hear their high pitched twitters while I have my morning coffee on the deck. Want to see inside a Tree Swallow nestbox? Click here. In addition to the Tree Swallows, the Barn Swallows have returned. One pair is trying to build a nest at the peak of the cabin roof under our eaves. Last year two swallows worked for a week in the same location, only to have their nest fall from the precarious spot. I hope this year's attempt is more successful. Barn Swallows are easy to distinguish from the Tree Swallows. They have a reddish breast and long forked tails. Yesterday Wayne and I joined the Powell River ATV Club for a quad ride from a camping head- quarters at Nanton Lake through the nearby back country. The logging roads were pretty dusty after several days with no rain, but it was a very enjoyable ride. Our lunch stop was at the popular former Fiddlehead Farm site. It was once a thriving hostel/wilderness resort, but now all that is left are a few apple trees and a grassy meadow. While we all rested and ate our lunch, we had a visitor. He was a very friendly and precocious Brown-headed Cowbird. He pecked at the ground for dropped morsels while we stood around and "chewed the fat." Cowbirds are termed brood parasitic. They lay their eggs in another bird's nest and then abandon them for the host bird to raise as their own. Cowbirds are a member of the blackbird family. They originally followed bison across the praries, but now have spread across North America. Their diet consists of seeds, small insects and the occasional dropped cookie crumb. Powell Lake is a very "rocky" place. Ancient volcanoes that formed the BC Coast Range have eroded over time leaving their granite intrusions exposed. Over time and with the help of ice age glaciers, huge outcroppings have been broken down and released into streams, rivers and ultimately the lake. Here are a few of my favourite rock shots. This solid granite outcrop is in my cabin's "back yard." A rock with a large, distinctive inclusion. 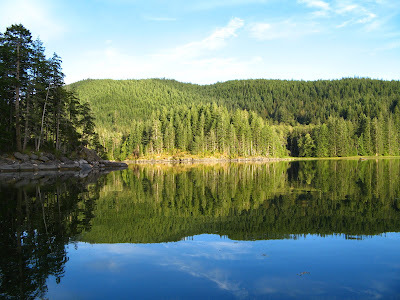 Quadra Island is one of the Discovery Islands between Vancouver Island and the mainland of Coastal British Columbia. 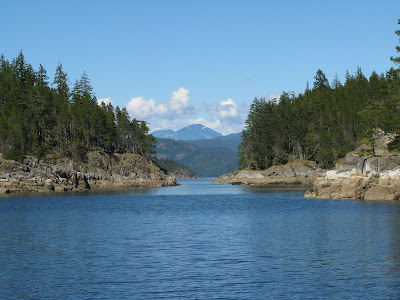 It was named after Don Juan Francisco de la Bodega y Quadra, an 18th Century Spanish Naval Officer who explored the area at the same time as Captain George Vancouver. 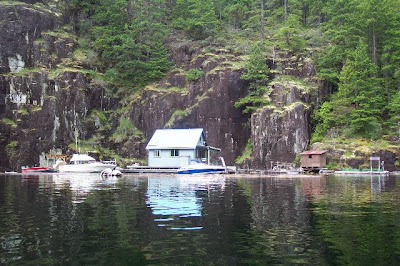 About 4,000 people live on the island, but in summer that number swells as tourists arrive by floatplane, boat and ferry. Quadra is a frequent destination for our 24' Bayliner Halcyon Days. The following are a few shots to entice you to come for a visit some day. 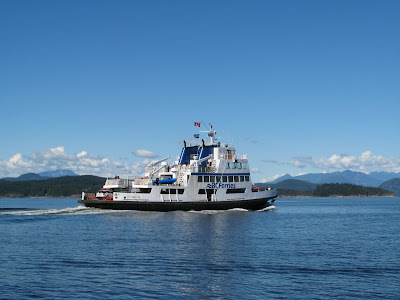 The ferry from Quadra to nearby Cortes Island. Each time I go up the hill to check on my potato patch I hear birds in the bushes and trees near my compost pile. They are quick and elusive, but a few days ago I was able to capture a few on film. The most evident thing was their crossed bills. After an Internet search, I have identified them as Crossbills, an apt name. I am not sure about the species, but think it is a Red Crossbill. Crossbills (genus Loxia) are members of the Finch family. Based on the coloring, I believe this is a female. Males tend to be reddish in color and females a greenish-yellow. The crossed nature of their beaks is specialized to allow them to remove seeds from conifer cones. I noticed the remains of cones on the ground next to the compost pile. I had assumed it was the work of a squirrel, but it must have been the Crossbills sitting in the trees cracking open the cones to extract the tasty seeds. Time slows for us when we are at our float cabin. This morning we heard an interview on CBC Radio with an author about a book called Slow is Beautiful. The premise is simple, we need to slow down and take time to appreciate life. It is even a trendy "movement" as described in this Seattle Times article. My comment back was, "Get a float cabin." Living away from town, TV and especially the Internet gives you the time (and the incentive) to slow down. Just take a look. 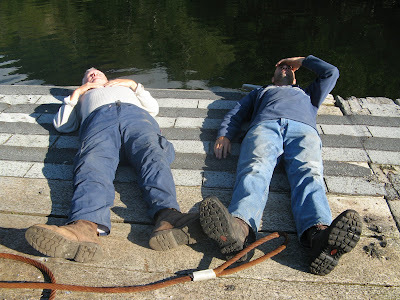 "Hey Wayne, let's just rest a few minutes here in the sun. Anyway, isn't it nap time?" "Hey Wayne, it's a long way to haul this sofa to shore. Besides, it's break time." See what I mean? All kidding aside, it's good to take time to smell the roses and connect with your inner self.